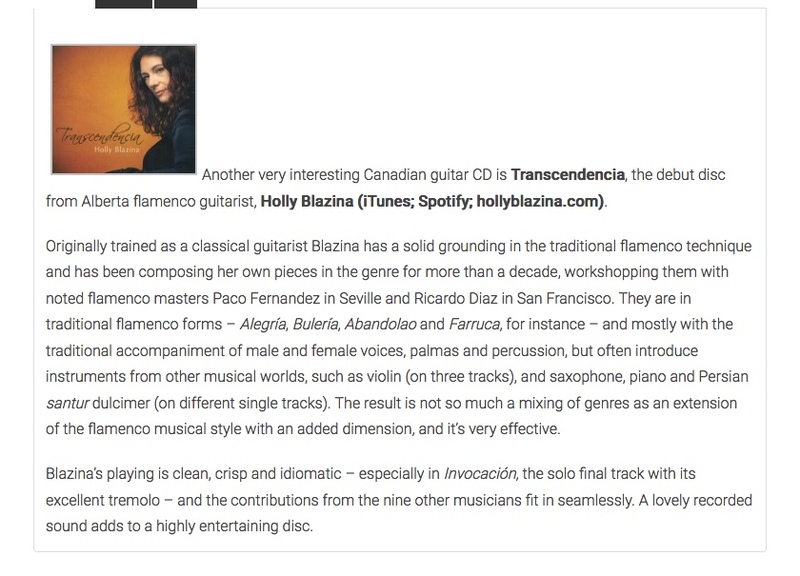 The debut album from expert Flamenco guitarist, Holly Blazina, is a testament to modern influences combined with care and respect for the tradition. To maintain authenticity, Holly prepared for this album by immersing herself in the Flamenco culture and workshopping her original compositions with master Señor Paco Fernandez in Seville, Spain. The compositions and arrangements on Transcendencia explore the full expressive capacity of the nylon-stringed guitar while bringing in modern elements not traditionally found in Flamenco, such as saxophone, violin, piano and santur (Persian dulcimer). With palmas, percussion and vocals associated with the genre, Transcendencia brings Flamenco into the wider musical community to see it flourish. This recording was made possible with the assistance of the Music Section of the Canada Council for the Arts.